Why install a fork brace on your motorcycle? The Motorcycle Fork Brace Stabilizer is Ready! 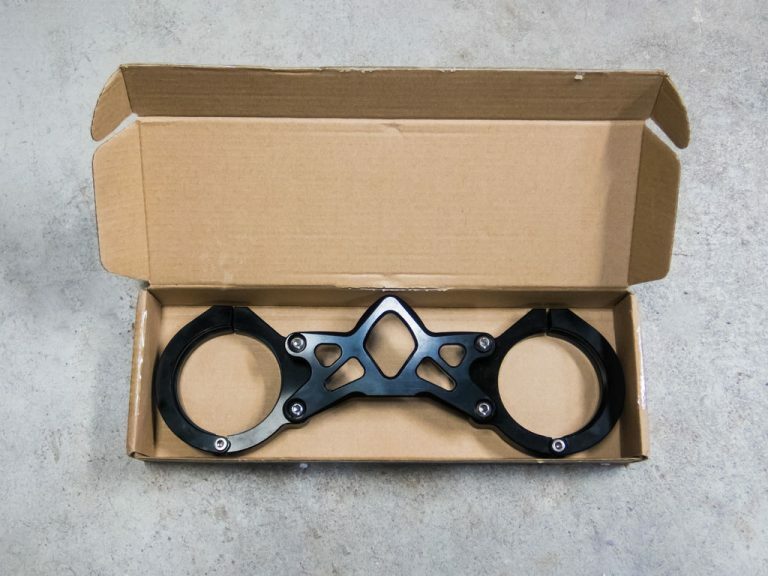 Here is the motorcycle fork brace stabilizer for the Kawasaki Ninja 650/Z650. It isn’t anything special, really. 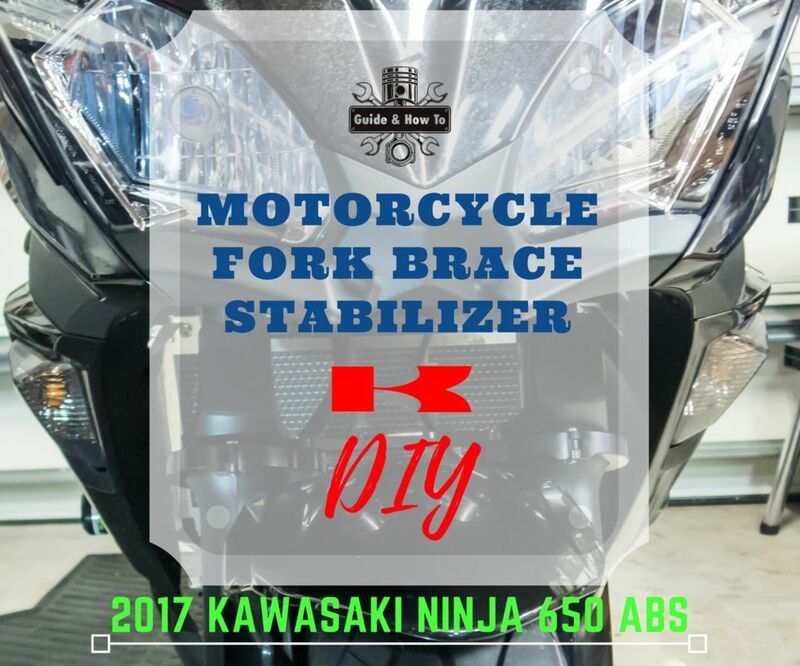 Why install a motorcycle fork brace stabilizer? Let me start out by giving you the straightforward, honest answer. It’s cheap, it looks good, and has a convincing theoretical function while taking minutes to install. That’s it. Let’s not pretend otherwise. Now if you want a more detailed explanation, – the type most likely churned out by the marketing rather than engineering department – some consider the forks torsionally weak. A fork brace helps remedy that. 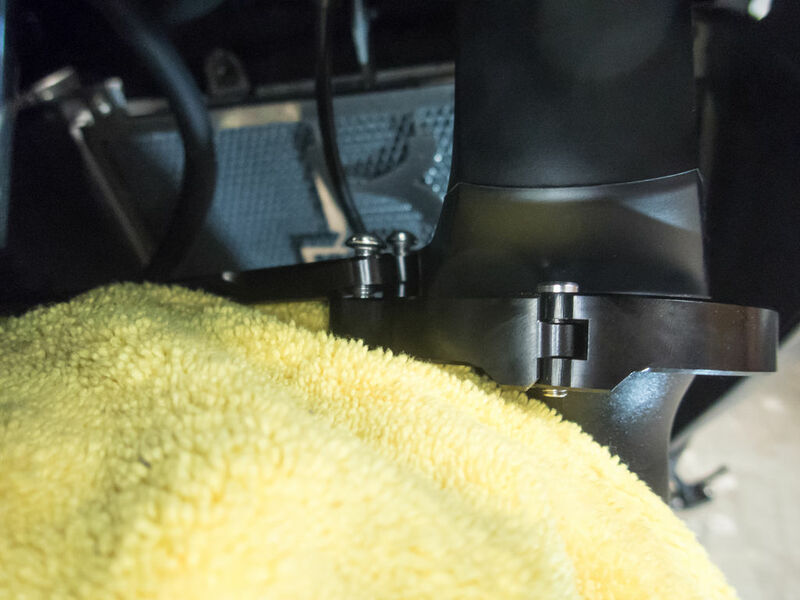 Rather than simply being held together at the bottom-end by the axle, the motorcycle fork brace stabilizer helps keep the forks in alignment and relieves them from some forces so it can concentrate on absorbing the suspension travel. 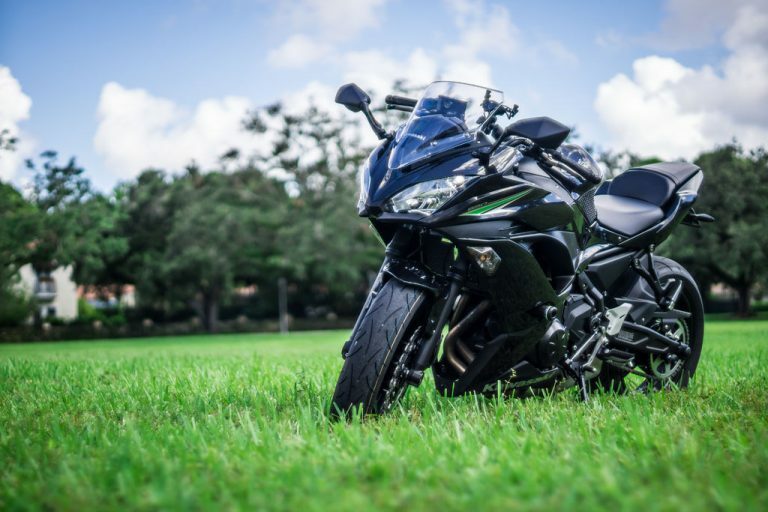 Typical claims are that they reduce torsional fork flex, speed wobbles, front tire wear, rain groove sensitivity and in general just provide better overall handling and stability. I’ve even heard that it reduces blinker fluid consumption, too. Will you notice any improvements? Maybe, maybe not. But the added bracing certainly won’t hurt. In other words, for the little hassle and cost, it’s a nice way to justify spending some quality time working with your bike. It’s not like you would have otherwise spent that money on buying something nice for your girlfriend, is it? 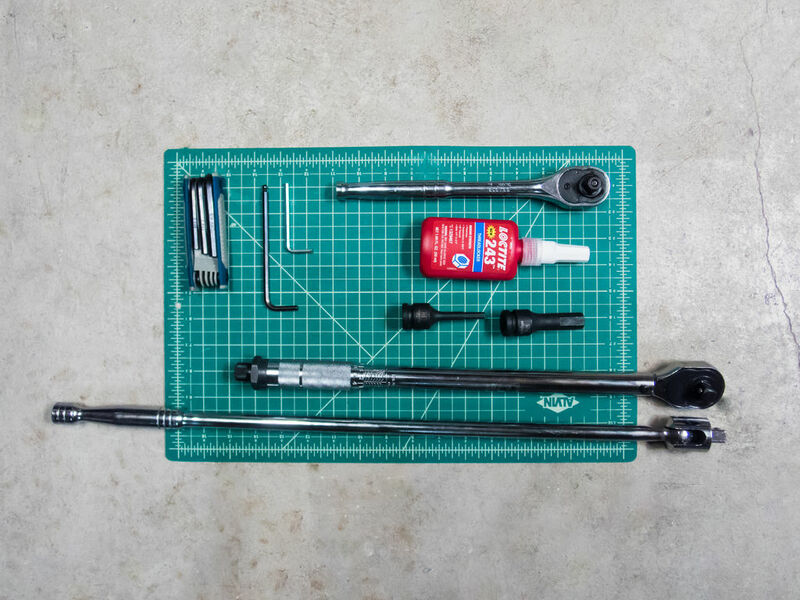 Here are the tools you’ll need to install a motorcycle fork brace stabilizer. The Fork Brace Stabilizer is the main component needed. To be honest, the bike doesn’t require a fork brace to be safe to begin with, so I don’t see any reason to buy an expensive fork brace. The asian bulk-CNC’d models will do a beautiful job for cheap as long as you inspect the item on receipt. Just remember to disassemble and threadlock every bolt – that’s non-negotiable. The best place to source the item for the cheapest price is Ebay in my experience. Regardless of the title saying Z650 or Ninja 650, both will fit. It’s the exact same part. Just buy whichever is cheaper. It should cost you up to around 30-50 bucks. I was very satisfied with the unit on receipt. It was made of 6061-T6 Billet aluminum, and was nicely machined and anodized. It’s also very rigid, even before properly tightening the bolts. I have no complaints whatsoever on quality. Given that it’s one of the nicer aesthetic and functional cheap upgrades for the bike, I definitely recommend it. 1/2″ Breaker Bar – To loosen the front axle, which is torqued up to 80 ft lb. Trust me, you’ll appreciate the breaker bar. 1/2″ Ratchet – Or a smaller ratchet with the requisite adapters. 1/2″ Torque Wrench – Or a torque wrench with a smaller drive and the requisite adapter. We will be torquing up to 80 ft lb. I wouldn’t forego properly torquing the axle. 5mm Hex Key – For the motorcycle fork brace stabilizer clamp. 6mm Hex Key – For fork brace bolts and front wheel axle retaining bolt. 15mm Hex Key – Ebay or Amazon – For the front wheel axle. This is certainly not a standard size, so you’ll need to buy one on its own if you don’t have one already. Or a set that specifically includes it. Rags – To protect the front fender from scratches during installation. Also for cleaning. Rear Stand – To keep the bike upright and stable while working. A front stand isn’t necessary. Threadlocker – Removing and applying threadlocker to any bolt before properly torquing is a must for motorcycles. Especially on something like this brace. This is where we’ll be installing the brace. Wipe this general area off with a microfiber towel to keep all surfaces scratch free. The first step is simply to stage the installation. Put the bike up on a Rear Stand and wipe off of the front fender and forks to remove and dust or grime that may scratch the surfaces. Pull out the tools listed previously and make sure you have them all available. Inspect the fork brace and make sure all the bolts were included and that everything is how it should be. If you’re curious about the OES frame sliders, the smoked turn signals, the radiator guard or any other upgrades on this bike pictured above, check out my Kawasaki Ninja 650 mods & upgrades list. If you haven’t by now, I’d recommend putting the bike up on a rear stand. It’ll make your life easier. Slightly loosen the axle. Only a centimeter or two, don’t remove it entirely. 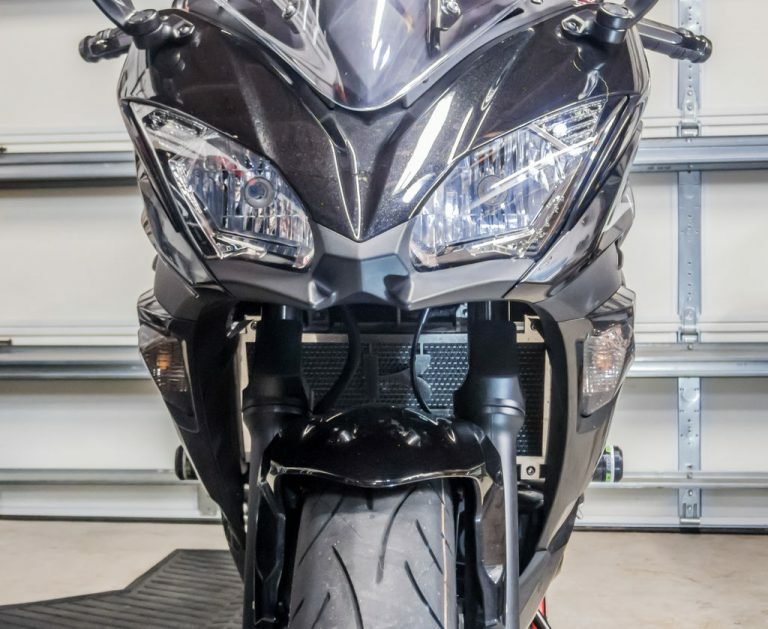 While I bet you’re not in the mood to deal with it, you should first loosen up the front axle to help align the motorcycle fork brace stabilizer in place. You might be able to install it without loosening the axle, but don’t bother. It will make your job harder and you run the risk of not getting the positioning right. You don’t need to remove it, just loosen it a bit. With a 6mm hex bit or wrench, loosen the retaining bolt and use a 15mm hex socket to loosen the axle. Next, remove those two bolts to separate that part of the bracket. Be careful with the little spacer on the back. Also, remove the bolts keeping the rings closed on both sides. This portion is where we’ll be installing the fork brace. Place a microfiber towel on top of the front fender for when you (inevitably) drop the bracket or screws, to avoid scratching it. This is how and where the fork brace should be mounted. That lip should fit as high as possible and fit right in place around both the fork and the mud guard. Place it with the hinge towards the front. The bolt closing the bracket should be located towards the rear. Thread the bolt, but leave it loose. Note: I tried installing some rubber grip tape under the fork brace so it wouldn’t mar the finish or move, but it turned out being undesirable and creating more problems than it solved. The brace is perfectly machined so damage isn’t likely, and it grips well enough on its own. Plus, the tolerances are tight enough that the tape simply doesn’t fit. In other words, don’t do this. But it was a good try though. Live and learn. Next, remove those two bolts to separate that part of the bracket. Be careful with the little spacer on the back. Also, remove the two bolts keeping the rings closed and apply threadlocker to the hinge bolts. Then install the motorcycle fork brace stabilizer’s right side loosely in place. Push it as high as possible so it fits right underneath the plastic mud guard. It should be gripping both the mud guard and the fork. There is a lip in the fork brace which fits perfectly in place. Install the bolt so that it closes the brace loosely. Enough for it to not fall down on its own, but not tight enough that you can’t still move it. You might have noticed the funny horn in the pics. 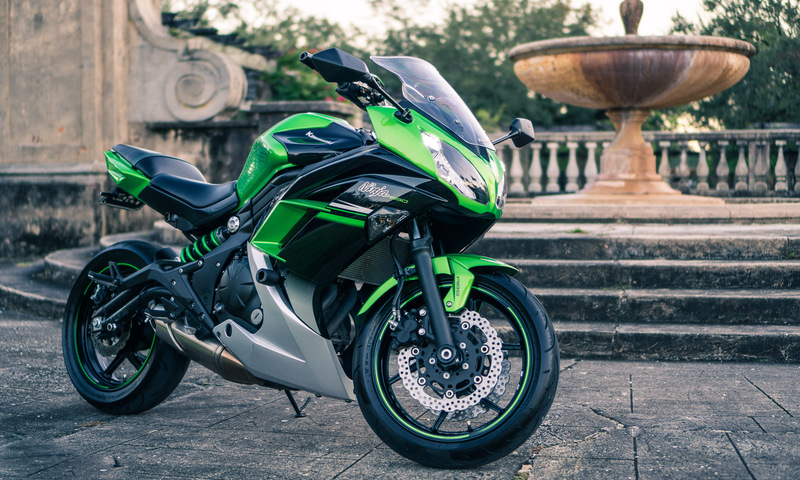 If you’re reading this, you probably have a Ninja 650, too. If you’re interested in a cool upgrade for the bike, I made a DIY on how to mount a Stebel Nautilus Air Horn on it. Definitely one of the funnest upgrades you can do to any motorcycle. Note – I initially tried installing some rubber grip tape under the fork brace so it wouldn’t mar the finish or move, but it turned out being undesirable and creating more problems than it solved. The brace is perfectly machined so damage isn’t likely, and it grips well enough on its own. Plus, the tolerances are tight enough that the tape simply doesn’t fit. But it was a good try though. Live and learn. Now it’s time to install the right side bracket. Install it in place, also making sure it’s pressing up against the mud guard. Now you’ll want to connect both sides of the motorcycle fork brace stabilizer together again. Once it’s more or less in place, remove every single bolt and apply a threadlocker to it – preferably the blue kind – then re-tighten to the proper torque. That would be quite tight, but not enough that it feels like something is going to break. This is an add-on reinforcement, so it won’t be seeing brutal forces anyway. The brace should feel like it isn’t applying any unnatural forces to the fork, nor bending it in any way. It should fit tight, though. The Axle should be tightened to 80 ft⋅lb using a 15mm Allen socket. Ideally you should use a torque wrench. The axle retaining bolt should be tightened to 35 ft⋅lb using a 6mm Allen socket. Once the motorcycle fork brace stabilizer is installed, re-tighten the axle. You really should use a torque wrench for this. The axle should be tightened to 80 ft⋅lb, and the axle retaining bolt to 35 ft⋅lb. While hard to see here, there is about a one centimeter gap between the fork brace and the fender. It shouldn’t look like it’s even close to touching it. Thankfully the part looks like it was properly designed for this bike. Make sure to threadlock and tighten properly every bolt. Verify the bracket is in its proper position, pressing up against the mud guard. Also check the fork brace isn’t touching the front fender (there should be roughly a one centimeter gap between both components). Finally, with the bike off the rear stand, press down on the fork to make sure it compresses and moves smoothly. Last step, open a beer. Well, you’re all done! Congratulations! Take it for a ride and let me know how it went. Also, if you’re curious about what other things I’ve installed on my bike, take a look at my 2017 Kawasaki Ninja 650’s upgrades list. You might see something you’d like for yours.